The exact way in which, in the mists of time, a herdsman discovered that milk left to rest at a certain temperature tended not only to acidify but also to thicken creating a solid mass, which could not only be manipulated and transported, but above all would keep even more easily than its primary ingredient, will remain a mystery to us. Just as mysterious are the reasons why he decided to explore the properties of substances, later revealed as coagulants, contained in the stomachs of certain animals and in plants. What is certain is that, despite important innovations in dairy production, and in the art of cheese maturation and seasoning, it will always remain a simple invention, basic in concept, much closer to our idea of a primary material rather than a transformed product. Milk, salt, rennet. Cheeses simple to produce, which could be consumed fresh or mature thanks to their excellent aptitude for maturation even in the most basic country cellar. Due to its simplicity, this cheese is influenced greatly by the quality of milk and the traditional production techniques used, which often don’t pay much heed to the quantity produced or production costs, and it is these factors which make it especially versatile, excellent with bread for a quick sandwich or a tasty conclusion to any meal if well seasoned. It could be defined a “primitive” cheese, intended not in the sense of ‘rough and ready’ but traditional and authentic, like the primary ingredient from which it derives. 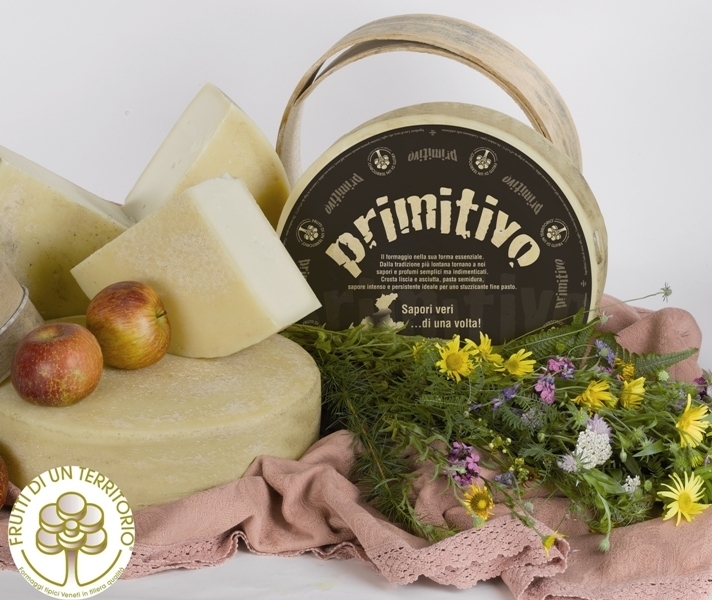 Primitivo is a table cheese with semi-cooked dough, produced from whole cow’s milk. Uniform straw yellow dough, with irregular scattering of holes, firm, elastic and compact consistency, thin regular rind, its flavour is harmonious and balanced.